SAL DeTRAGLIA'S VIRTUAL TAPAS BAR: BIG BIRD. Spain has one of the lowest birthrates in Europe. But you can’t blame that on a lack of storks. If you look up any church bell-tower in central or southern Spain, you will likely see one. Or two. Or more. 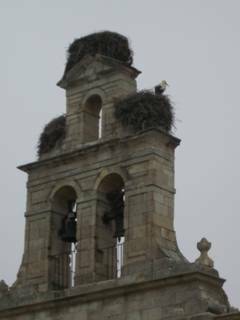 Pictured above is a white stork that I spotted on a church in Zamora (Castilla y Leon) last weekend. Of course, storks are easy to spot…because they are enormous. They have six-foot wingspans. And if you think the birds are big, you should see their nests. I would not be surprised to learn that some stork nests sport a wet bar and home cinema. Rumor has it that Bruce Willis may buy a vacant one in Marbella for use as a winter home. Spaniards seem to embrace the stork. Churches and other towering municipal structures actively encourage their presence by erecting platforms on which they can more easily build their nests. Spanish tourists embrace the stork, as well. When my friend “Scott the Texan” visited last year, we took him on a day-long walking tour of the Madrid-area’s historic sites. And what’s the only thing he remembers from the tour? Storks. Spain’s storkification does, however, require some caution. Specifically, I would not recommend standing too close to a church bell-tower. My grandmother once told me that being hit with a bird dropping is good luck. But where storks are concerned, there is arguably such a thing as too much good luck.